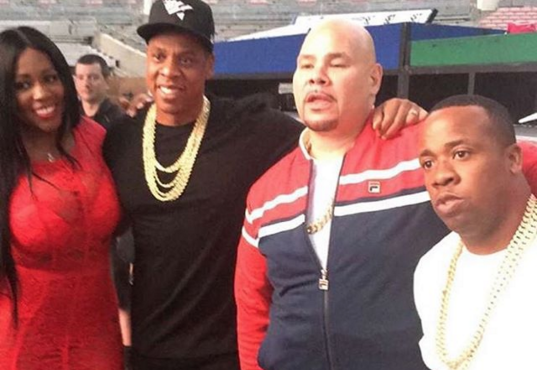 Jay Z Hops On Fat Joe & Remy Ma's Official "All The Way Up (Remix)"
New York City, New York – Jay Z and Fat Joe don’t have the friendliest of backstories but what heavyweight rappers do during their ascension to greatness? Beyonce’s hubby doesn’t rap much these days so when he breaks his silence to hop on a beat, you can best believe he checks off all the current events on his lyrical Rolodex (he name drops the Lemonade success while paying homage to the late Guru, turns Prince’s final moments into a metaphor, etc.) just in case you thought he doesn’t have his ear to the street. Remy Ma is her usual bar-dismembering self, employing a count-off rhyme scheme to make her presence felt, while Fat Joe holds both verses together. The decision to record the remix was seemingly made at Beyonce’s recent Formation Tour pit stop in Los Angeles, where Joey and Jigga shared an Instagram moment complete with the song used as the caption hashtag. Listen to the Jay Z “All the Way Up (Remix)” down below via DDotOmen.